Read the RPM of Nitro, gas, and electric motors from audio frequency at distances in excess of 100 yards! Uses no optical or contact sensors! Useable range from 3,000 to 50,000 rpm. Works with Nitro, Gas, and Electric motors. Use on cars, boats, planes & helicopters. Self-contained, uses standard 9-volt battery. Accurate to within 1,000 rpm. 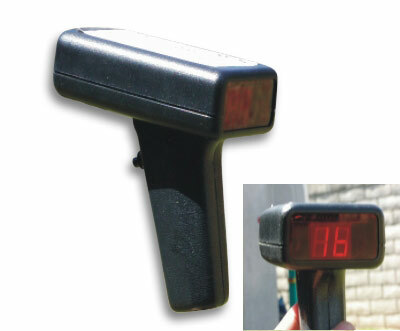 Trigger control with large, bright LED display. Use for distances in excess of 100 yards.